This morning I had a job interview, and it really was a reality check of some sorts. We all hear about the poor economy, high unemployment, etc, etc.. But fact of the matter is until it affects someone you know or your own family, it's hard to understand how really bad the economy is at the moment. And with the holidays coming up is it going to be very tough for so many families and individuals. Anyway, let me focus on today. The interview went well, the woman was pleasant, and so we got to discussing the economy. And she was telling me how within 10 hours of placing the job posting online she was bombarded with over 500+ emails. Honestly, do you know how many resumes that is to receive in a matter of hours? It is crazy. I used to review resumes for a previous company I worked for, and back when the economy was good one might receive a quarter of those resumes over a week span of the posting. Interviewing in this economy is definitely tough, not to mention the competition is fierce. It's a whole new ballgame. And what is interesting is the pay scales/benefits vary so much too. One job offers great salary but only a weeks vacation. Another offers incredible vacation time but low salary. And in the end the job seeker doesn't have whole lot of bargaining room because there are hundreds in line who could fill the position. Ahhhh....what a reality check. And one has to wonder how our country is ever going to get the economy back on track. I hear the Republicans want to prevent unemployment benefits from being extended. Really? Are they living in reality? Probably not. Personally, I think all these politicians need to go live with an average American family for a few months, because they just don't see the world as it really is. It isn't about being right or wrong, what party one belongs to, etc., it all comes down to what will help the people of this country. The stories are happening all across the country,,,,families who can't afford their houses, to feed their children, who can't find work after being employed for over 20 years, etc.. We are talking about people who have worked hard their whole lives and now can't find a job to support their families and themselves. This isn't about being right or wrong, this is finding a solution and helping those in need. This country needs to come together to seriously address these issues and more. Personally, I don't understand how we can send money to help other countries out, yet bark at helping our own citizens. I'm a firm believer that you help your own people out first. But such is life everyone has their own opinions right. Some days I wish I could run for president. Be that write in name on the ticket. haha Imagine that an average American, not some career politician being elected President. Now that would be awesome! It's just frustrating. And I just wonder what the average American can do to make a difference. A real difference. Know what I mean? 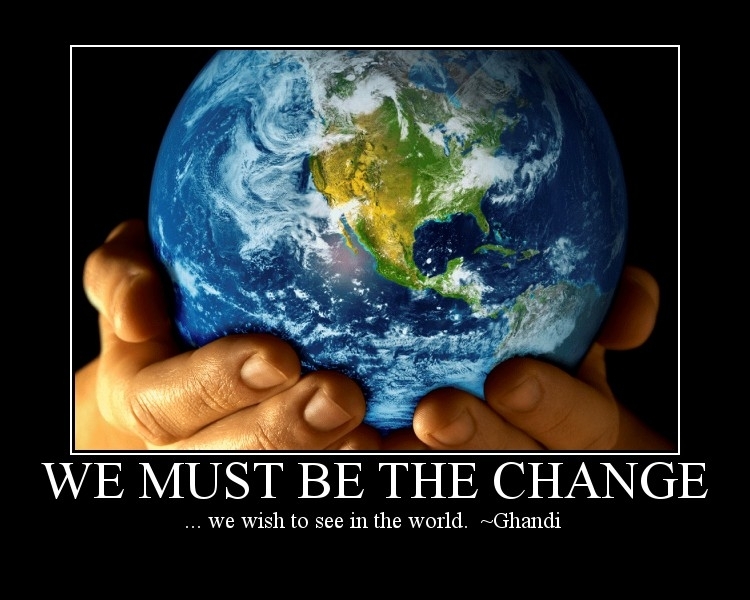 Mahatma Gandhi once said "be the change you want to see in the world." Those are words to live by, but question remains....can one person really make a change, a change that leads others to follow, a change that has the good of all in mind? I agree! It's so hard to see everything kind of crumbling around us. My dad is one of those people and the last year he has been so stressed out. I can't remember the last time he really smiled. It breaks my heart to watch him have to give up some of the stuff he loved and earned. I hope you get the job though!